Велосипедизация Санкт-Петербурга – Velosipedization of Saint Petersburg, is an organisation that wants to promote cycling in Russia’s second largest city. This organisation invited me to speak on their second annual conference on Friday the 15th of May last. The other foreign speaker was Christian Spath from Berlin, a city planner, architect and sociologist. Together we were the international component of this conference. We were welcomed with open arms and pampered the whole weekend. 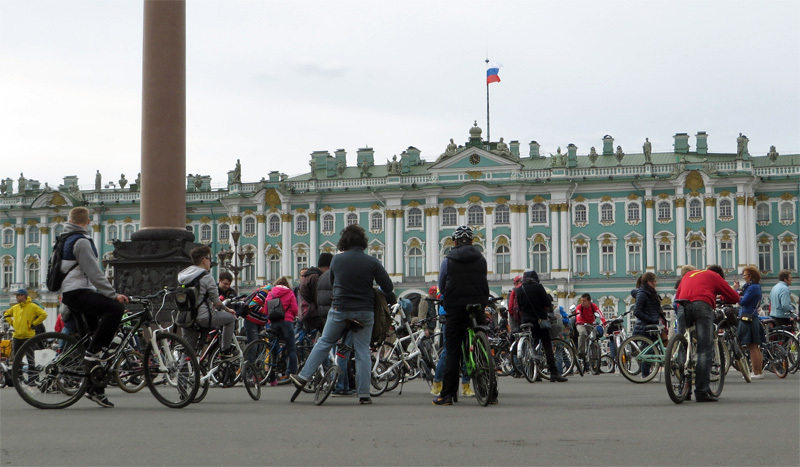 Gathering for the cycle tour on the Palace Square in front of the Winter Palace in St. Petersburg. The city of 5 million is beautiful. It was founded by Tsar Peter the Great in the very early 1700s, after his tour of Europe to learn more about how you build a navy and a port. He studied a lot of European best practice (also in the Netherlands) to turn that very successfully into his own Russian version of what a great sea port city should look like. This core of the city was expanded in later years and each era has a distinct character. 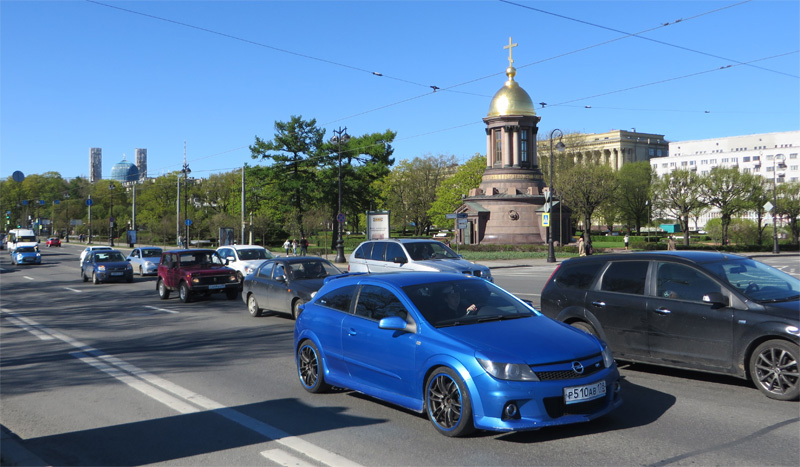 But what the baroque city centre, the Stalinist expansions and the other parts of the city have in common, are very wide streets that are first and foremost used for motor traffic. Pedestrians are catered for, but for people cycling there is almost nothing when it comes to specific infrastructure. There now is a bike share system, – I understood the bicycles came second-hand from Moscow, after Moscow recently got a new system – but there is no real place for these or other bicycles in the streets. A street in St. Petersburg. A lot of space is allocated to motor vehicles. Velosipedization is completely run by very enthusiastic volunteers. Students and young urban professionals who have to do this in their sparse free time. For this conference they were advised and assisted (also financially) by the German Foundation “Friedrich Ebert Stiftung”. Together they were able to make this a good conference. 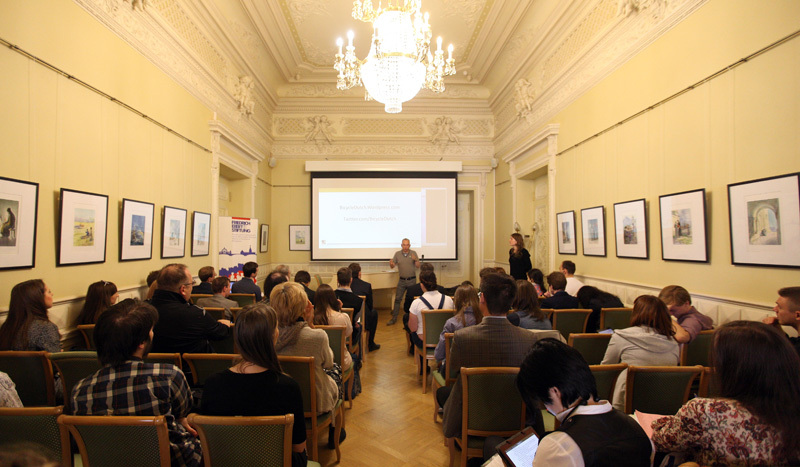 They got Александр Мишкевич, (Alexander Mishkevich) the head of the Transport and Infrastructure Development department of Saint Petersburg to speak, but also to listen to the other speakers. I showed many video clips of how we got to where we are in The Netherlands today. Especially eye-opening for many in the audience were the images of Dutch streets in the 1970s, when they were full of motor traffic and then these same streets now, full of people cycling. On behalf of the Berlin department for Urban Development and the Environment Christian Spath explained many aspects of the master plan for cycling in Berlin. There were also two local planners who were involved in making the actual drawings of the first cycle route of an ambitious plan for 16 cycle routes in Saint Petersburg, that will run from the outskirts of the city to the edge of the city centre. 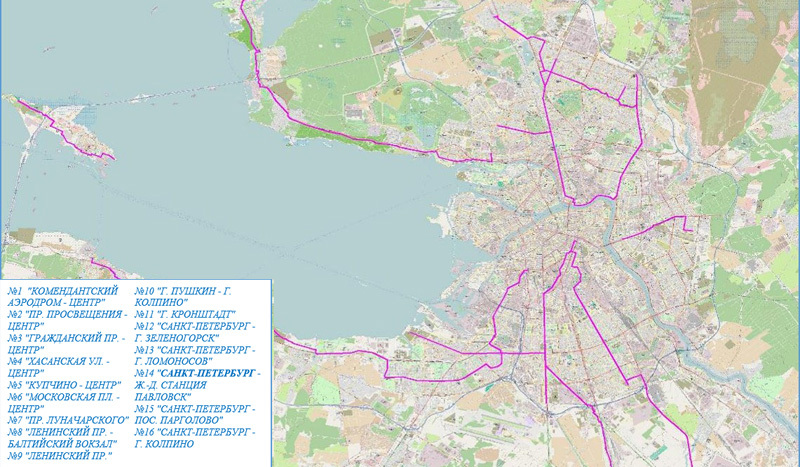 Map with a part of the 16 proposed cycle routes in St. Petersburg. After the break there was a panel discussion about this plan. As foreign experts we were invited to say something about the first of these routes. I had discussed this before, with Dutch experts, to see that what I would say was indeed in line with what Dutch experts would say, and it was. 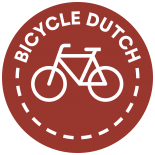 The points that stand out from a Dutch perspective are that the route is not continuous. It stops at every junction. Junction design was not yet considered. The route is sometimes bi-directional on one side of the road and then a few blocks later it is suddenly on the other side of the road. That is already inconvenient, but without well-designed junctions that will also be dangerous. As a cyclist you need to get across multiple lanes for motor traffic and to the other side of the road. In the case of bi-directional cycleways you will get to the intersection from unexpected angles for motor traffic. Not a good idea in an environment that is not used to people cycling. Space for the new cycle route will only be taken from pedestrians, even though the car lanes are 3.5 metres wide. A width that is reserved for motorway lanes in The Netherlands. 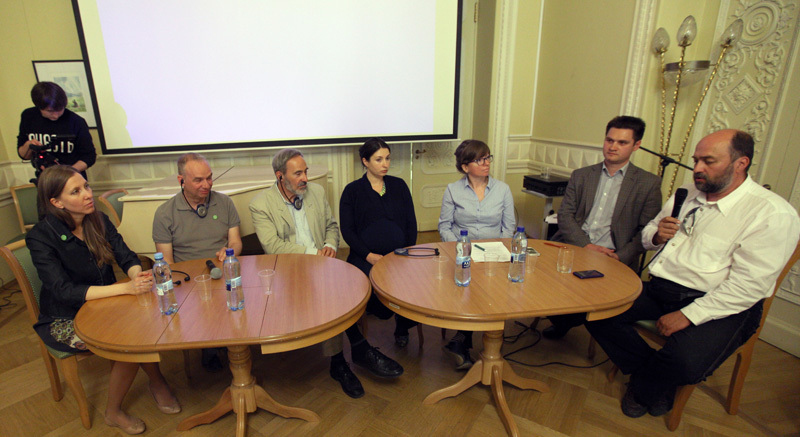 The panel discussion in the conference. Picture: Velosipedization (published with kind permission). The planner responded that there were all sorts of reasons for the fact that the route was on different sides of the road sometimes. Pipes and cables, protected green space, to name but a few. Reasons not unfamiliar in any planning project. But it is clear that here there is also a lack of real political will and quite simply money. Taking space from pedestrians with just paint and having a sign saying the route ends right before every junction is not going to give you a convenient cycle route. These three cyclists choose to cross the wide street at the pedestrian crossing. That is why Christian Spath had a recommendation. Why not start in one of the suburbs with a much less ambitious plan? A metro-station is being built. Why not make sure that this station is suited for multi-modal transport? Connect the station well with a number of smaller cycle routes in that suburb. Make sure that people living there can do their groceries on their bicycles and get their children to the schools in their own neighbourhood. If they can also go to that station to park their bicycles to get to the rest of the city by metro, this smaller project would be beneficial to a lot of people. With this project you can then gain the learning experiences you need for the larger routes. This would give you a much more natural development than creating a complete citywide cycle network out of the blue. 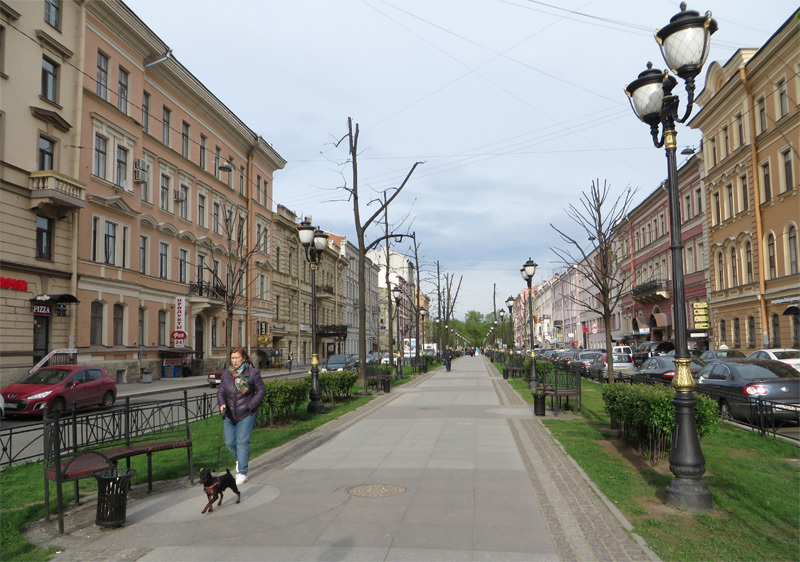 A street in St. Petersburg that was turned into a beautiful promenade. But there was no space created for people cycling. That there is a lot to learn became clear in the news item that was broadcast in Saint Petersburg. The head of the Transport Department said in the interview that any well-thinking person knows there is no space for cycling infrastructure in the city centre. After which I appear saying that the streets in the city look incredibly wide in my Dutch eyes and that I feel a lot of the available space is dedicated to motor traffic. Russian law has recently been changed. From now on motor traffic lanes are allowed to be a bit more narrow. The delegate from Moscow showed in her presentation that Moscow has already planned an experiment with a more narrow car (parking) lane to make space for people cycling. This is a very good development, because Saint Petersburg and Moscow are of course rivals and when one does something, the other doesn’t want to stay behind. There’s nothing wrong with a bit of competition. Another novelty in Russian law is that it is now allowed to cycle in a dedicated bus lane. This was seen as an improvement. In Berlin this is also common practice and I was told it works well, but only when the bus lane is wide enough for the bus to overtake a cyclist. In The Netherlands we do not allow cycling in a bus lane. The huge difference in mass and speed between a bus and a person cycling is unacceptable in the ‘sustainable safety’ policy in our country. The hall in which the cycle conference was held in St. Petersburg. Here I am giving my presentation about cycling in urban planning in The Netherlands. Picture: Velosipedization (published with kind permission). On Saturday 16th May the big cycle tour was on the program. It was great to be on a bicycle again! For two days, Christian and I had made big walks to see the city (we had a lot of free time!) and we noticed right away how much more convenient it is to be on a bicycle. The city had not given permission to close streets for the cycle tour, but it is of course always allowed to cycle with some friends. To avoid troubles, the organisation urged people to carefully stick to the traffic rules. So the whole parade was positioned to ensure that everybody would cycle two abreast and not in a group. All traffic lights were observed well. Which was easy, because traffic lights have a counter in Saint Petersburg, counting down to the next red light. When it was clear there were only a few seconds of green time left – not enough for the whole parade to get through – a stop would already be made. The tour gave us some idea of what it was like to cycle in the city, but not really. Still it was enough to make me think that I wouldn’t find it very appealing to cycle there on my own. The cycle tour in the city centre of St. Petersburg. The tour ended in Таврический сад (Tavrichesky garden) a beautiful park where everybody gathered for a picnic. People admired each other’s bicycles. Some tried out the bikes of their friends. People talked and they just had a good time. There were lovely people but it wasn’t really a broad range of all people in society. Politicians could dismiss this as an out-group and that should change. For your demands to be taken seriously you need more people of older age groups and also families with children. They were already there, which is a good sign, but they were still a bit under-represented. Velosipedization handed out buttons with their name that people gladly accepted. Great for the sense of belonging. Many artists had been willing to design posters for an auction to raise funds. The posters sold well in the auction. The starting price had been 10 roubles, but some went for 600! It turns out that there is warm support for the work of the volunteers of this organisation. This is very good because there is always the risk that enthusiastic volunteers burn-out when things do not progress soon enough in their eyes. And there is such a lot to do in Saint Petersburg that it will take a lot of time and effort. But I have the feeling the right road was chosen, so I will follow the developments with great interest. Very interesting breakpoint there in Saint Petersburg for the development of cycling all over the world, and a very interesting article, Mark. St Petersberg is _so_ beautiful and so ripe for a rich bicycle culture. Flat, wide streets and few mid-block crossings. I hope it happens. One place I did see a reasonable amount of casual cycling was in Kazan – a beautiful cosmopolitan city. Wonderful! And of course cycling has grown in Montréal, Minneapolis and several Scandinavian cities with serious winters. Speaking of Montreal, would you also do a video on cycling in Minneapolis (in particular, you did do one on the US in general), Montreal and Vancouver? 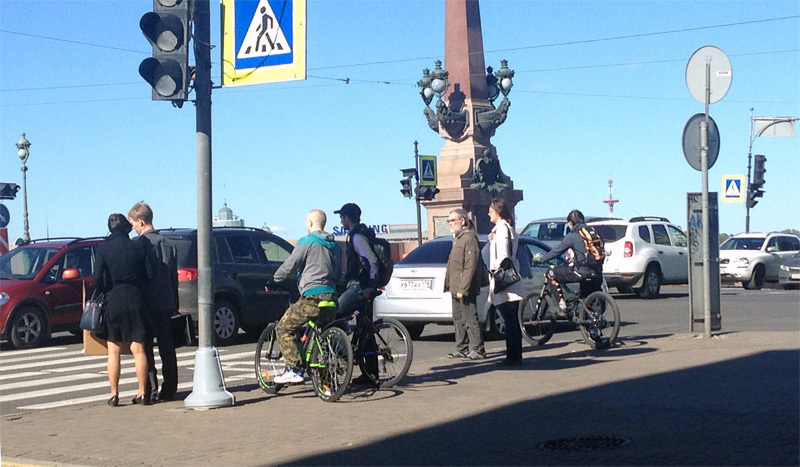 This entry was posted on 26 May 2015 by Bicycle Dutch in Original posts and tagged bicycle culture, campaigning, Russia, Saint Petersburg, watching people cycling.